The Big Wobble: Alaska's busy Bogoslof volcano exploades volcanic ash cloud rising to an estimated altitude of 34,000 ft (10.3 km). Alaska's busy Bogoslof volcano exploades volcanic ash cloud rising to an estimated altitude of 34,000 ft (10.3 km). AleutiansVolcanic Activity Summary: A short-lived explosive eruption of Bogoslof volcano was reported by several pilots around 0100 UTC (4:00 pm AST). 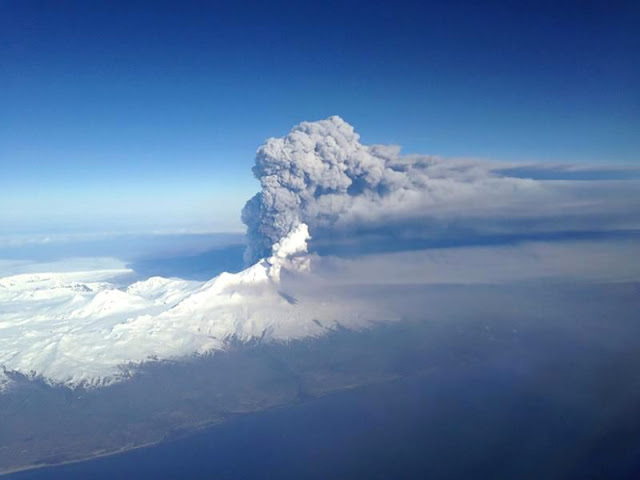 They reported a volcanic ash cloud rising to an estimated altitude of 34,000 ft (10.3 km). Satellite data show a discrete, short-lived explosion just prior to 0100 UTC that detached and drifted to the south by 0115 UTC. A subsequent pilot report from 0150 UTC indicated that activity had decreased. On the basis of this information, the Aviation Color Code is increased to Red and the Volcano Alert Level to Warning. There is no ground-based volcano monitoring equipment on Bogoslof volcano so AVO is unable to provide a forecast of future eruptive activity. We will monitor satellite images and data from distant seismic and infrasound instruments for indications of significant explosive activity.